At River’s Edge, the name says it all. This 2-bedroom, 2-bath cabin sits right along the river, offering tranquil views of crystal clear water all year long. 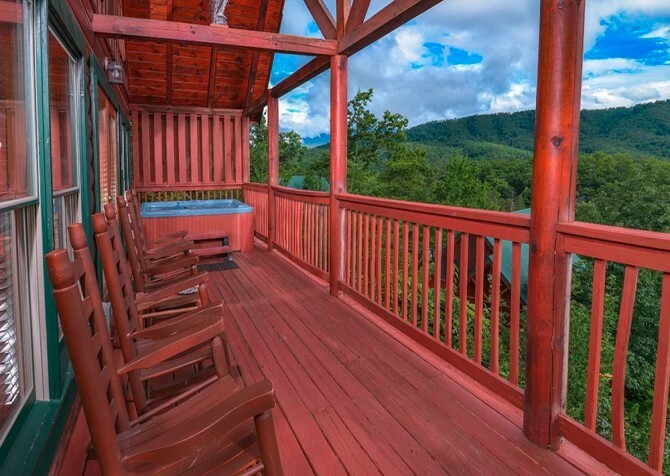 Enjoy these views from your covered back porch with rocking chairs and an outdoor hot tub. Or relax among the modern mountain décor found inside the motorcycle-friendly cabin. 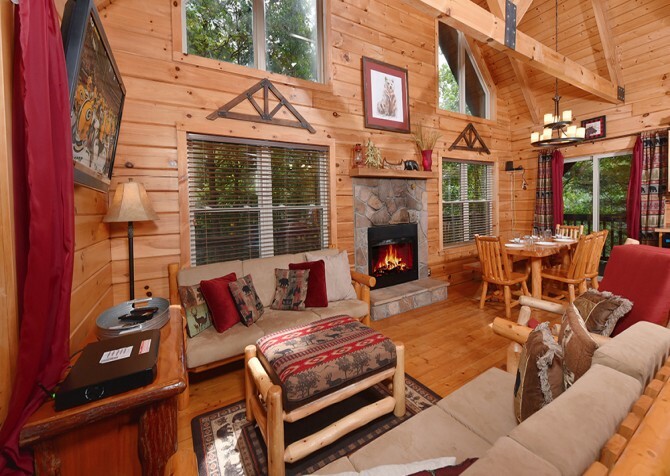 River’s Edge is an ideal retreat for families or a small group of friends traveling to the Smoky Mountains. 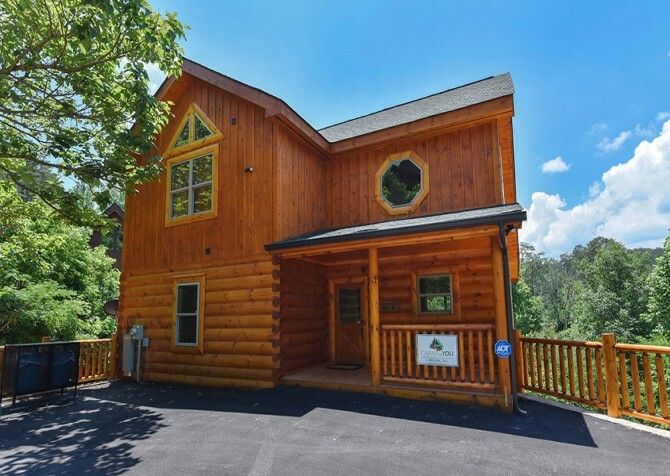 You can sleep up to 6 guests comfortably at River’s Edge, and you’ll find plenty to keep everyone in your group entertained, especially given the cabin’s ideal location—you’ll have less than a three-mile drive to downtown Pigeon Forge! For a peaceful getaway with the ones you love, book your stay at River’s Edge. The grand entryway of this cabin is sure to impress you and your guests when you arrive at River’s Edge. With high ceilings, an open-concept layout, and updated mountain décor, this cabin is not only on the edge of the river, but also the edge of luxury and style! Enjoy a blend of natural wood and polished metal in the furnishings as well as modern electronics like the giant flatscreen TV above the stone fireplace. This fireplace is gas, so you can easily create a cozy atmosphere on those cool mountain evenings. And everyone in your group will find a place to relax with the multiple seating options in the River’s Edge living room. Enjoy a large couch with a coordinating loveseat and chair. There’s also a large ottoman that can double as a coffee table for game night. Side tables, reading lamps, and windows all around complete this living room, making it the perfect place to relax with a book or root for a favorite team on Sunday afternoon. The modern mountain charm of River’s Edge continues in the gorgeous kitchen that comes with this cabin. From granite countertops to tile floors, this kitchen has all the updates you love without the high price tag. And the dark cabinets are a perfect complement to the oak-colored walls found throughout. Enjoy black and stainless steel appliances at River’s Edge, as well as all the little things you had to leave at home—a coffeemaker, a toaster, an electric can opener, and more. Whatever you’re used to having when it comes to cooking for the family, you should be able to find it in this kitchen. There’s even an attached breakfast bar with three stools that can double as extra counter space while you cook. Eating out is a great idea when you visit the Smoky Mountains. There are dozens of restaurants in Pigeon Forge that are close to River’s Edge and worth trying while you’re in town. But when you’re ready for a quiet evening in, be sure to take advantage of the quaint dining space that comes with this cabin! Enjoy a delicious homemade meal amidst the ambiance of the flowing river right in front of you. The dining room of River’s Edge has three large windows overlooking the river, a large wood table with four chairs and a bench, and modern overhead lighting. On rainy days or those days you just don’t feel like venturing outdoors, you’ll find plenty of fun things to do inside River’s Edge, starting with its rec room. Located upstairs in the loft area, this rec room has plenty of space to move around—something you’re going to need when you’re planning your next shot on the full-size billiards table! Challenge your friends to a game of 8 ball, or play a game of cards on the corner table with pub-style chairs. There’s also a stereo, comfortable couch, side table, reading lamp, and wall of windows in this versatile space. So plan for a day indoors that’s full of fun at River’s Edge! Long days of fun touring Cades Cove or the Smoky Mountain breweries, wineries, and distilleries are sure to make amazing memories, but they’ll also leave you wiped out if you don’t get some good rest. At River’s Edge, you have several comfortable options, including two bedrooms with king-size beds and a sleeper sofa. In the first bedroom, enjoy modern mountain furnishings like side tables, reading lamps, a dresser, and a plush chair where you can relax in the evenings. There’s even an indoor jetted tub in this bedroom, providing the perfect place to soothe your sore muscles after walking downtown. The second bedroom has many of the same features with the added bonus of direct porch access. You can soak in the hot tub with views of the rolling river before heading to bed. 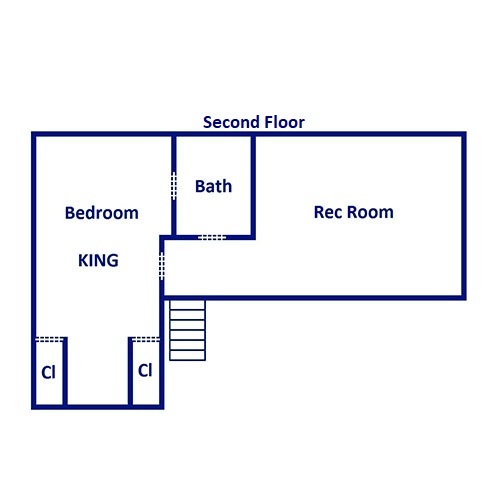 Both bedrooms come with their own TV sets, so no one has to fight over the controller in the evenings. And these bedrooms are accompanied by 2 full-size bathrooms with shower/tub combos and double sinks—plenty of space for your group of 6. 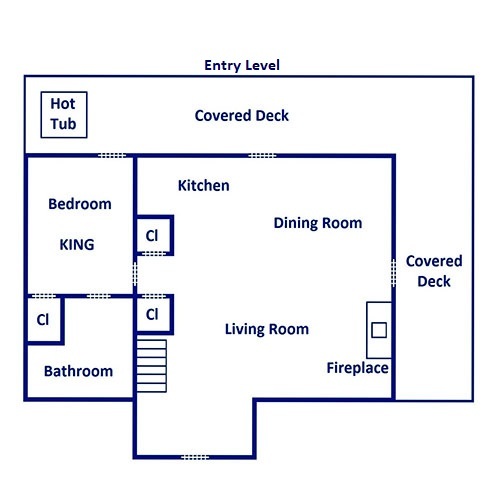 The lower-level bathroom offers easier access, with wide doors and a handicap-accessible shower. It’s already been said, but it’s worth repeating—River’s Edge offers amazing views of the tranquil river. And what better place to enjoy those views than on your very own rocking chair porch? This cabin comes with four rocking chairs as well as a small table with seating for four that overlooks the river. Enjoy a quiet meal here or sip your favorite Smoky Mountain wine in the evenings. And, of course, we invite you to take advantage of the covered outdoor hot tub that comes with River’s Edge. This hot tub has a private screen, so you can soak any time of year in complete privacy during your Smoky Mountain vacation. A final outdoor accessory we think you’ll find handy at River’s Edge is a gas grill—perfect for your Memorial Day barbecue or family cookout during your stay. We’ve already listed several amazing amenities that come with River’s Edge, but that’s not the complete list! This cabin also offers an ironing board, washer/dryer, and free Wi-Fi. 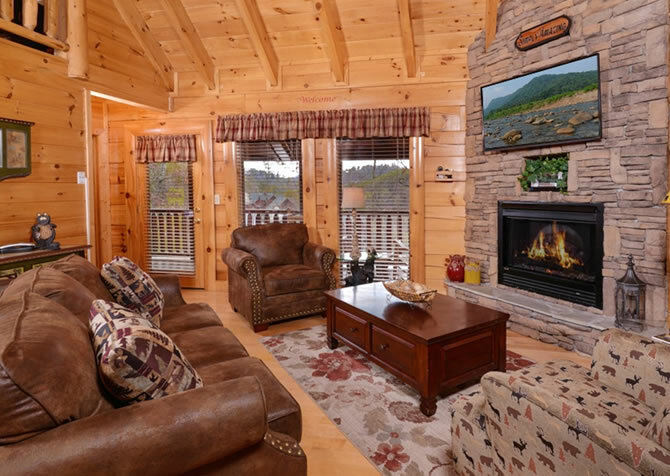 We want your Smoky Mountain stay to be comfortable, fun, and convenient, so we try to provide all the comforts of home in our cabins. Even better, at River’s Edge you’ll find the grounds to be motorcycle friendly, so we invite our biker friends to book their stay at River’s Edge for a Smoky Mountain getaway like no other! Get your cowboy boots on and get ready for a wild ride at Dolly Parton's Stampede! This rodeo dinner show has a little bit of everything from trick riding to dancing to good ole Southern fare. Less than two miles from River’s Edge is the top theme park of the South known as Dollywood. With high-octane rides and live musical entertainment, this family-friendly attraction is sure to be a hit! You don’t have to worry about finding things to do when you’re at The Island. This is your one-stop shop for family fun in Pigeon Forge with restaurants, shopping, carnival rides, and more! "Edge of Paradise could not have been any better! From the amazing amenities such as the indoor pool and hot tub to the comfortable seating overlooking beautiful views- this cabin's quality is truly the best I have ever seen. The decor and set up of this cabin makes me feel as if I am in a luxury hotel- nestled away in the mountains. The quality of this cabin is the best I have ever experienced, and I now find it hard to stay elsewhere. Could not ask for a better…"
"Edge of Paradise could not have been any better! From the amazing amenities such as the indoor pool and hot tub to the comfortable seating overlooking beautiful views- this cabin's quality is truly the best I have ever seen. The decor and set up of this cabin makes me feel as if I am in a luxury hotel- nestled away in the mountains. The quality of this cabin is the best I have ever experienced, and I now find it hard to stay elsewhere. Could not ask for a better cabin! The customer service was fantastic, and I could not have asked for a smoother reservation!" "Edge of Paradise is an amazing cabin. From the Jetted tub, the in-ground pool or the beautiful view, this cabin is very romantic. The kitchen has everything you need, and there is a grocery store about 5 minutes away. The cabin’s location makes it great if you want to be alone, but close enough to town if you want to go to some shops or get something to eat. I would highly recommend this cabin, and we look forward to coming back soon!"